Our deck-to-screened-porch conversions accentuate the positive while eliminating the negative aspects of outdoor living! 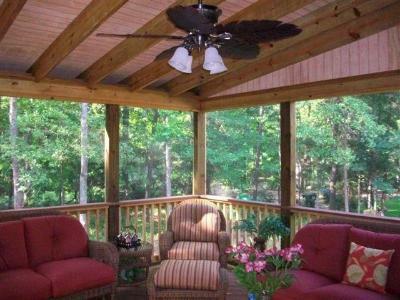 This lovely screened porch addition is built over a low-maintenance composite deck. Just like anything else in our lives, our outdoor living needs can change. A beloved deck that was once the center of recreation in the backyard can become a spot rarely visited because of simple changes in the way you now live outdoors. Maybe the kids have grown up or gone away to college, or your preferences for outdoor living have shifted towards a protected space rather than open. No matter what the reason is behind your changing needs, your backyard deck may be the perfect candidate for a screened porch conversion to better accommodate your evolving outdoor living needs. 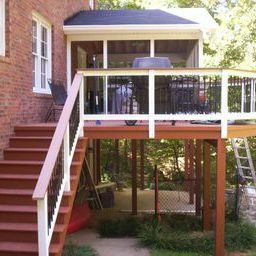 Elevated deck and screen porch in Lexington, SC, by Archadeck of Central SC. 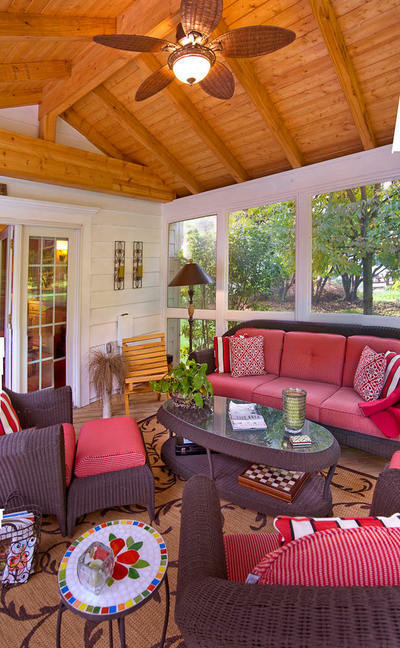 Charming wooden screened porch in Columbia, SC. Screened porches offer what open air outdoor structures cannot: shade and protection from harmful UV rays, protection from nuisance insects such as mosquitoes, and an outdoor area that can be utilized during inclement weather. How many times has a spring or summer shower forced your backyard event indoors because of the lack of protection offered by your deck? By converting a deck that has lost its charm into a screened porch, you can have an outdoor living space that delivers the qualities of an outdoor room giving you the best of both worlds! Though a deck-to-screened-porch conversion may seem like a daunting task, in many cases it is not. However, there are certain criteria that must be met to ensure your existing deck can support the added weight of a roof and the additional standards required in making the conversion. In most cases, conversions are possible, but it is crucial to hire an outdoor structure professional who is knowledgeable about decks and outdoor structures.Hiring a professional ensures the safety and success of your intended conversion. 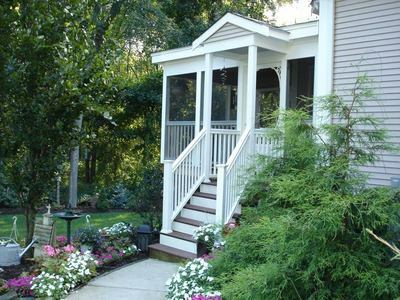 Several factors come into play when you consider a deck- to -screened -porch conversion. Deciding whether a conversion is possible first begins with an evaluation of the structural components of your existing deck. A good majority of decks are not built to support the weight of a roof, so you will need to first verify yours is built strong enough to withstand a roof addition. Other factors are how the deck was originally built and what kind of foundation does it have. What kind of joists and beams does the deck have? All these are important questions that have to be addressed before planning can even begin. In many cases we can retrofit the structure by installing new footers to support the new weight of a roof. A foundation strong enough to support a roof needs to reach all the way to the corners of the structure. So, if you wish to expand and add a new roof, the foundation of the structure must be extended and new footers added at the corners to support the weight. What seems like the most simple of questions has to be answered prior to moving forward: can your builder even get underneath the structure to reinforce it? Imagine the extended outdoor living enjoyment possible with a screened porch or outdoor room. South Carolina, like many areas of the country, requires everything a builder does to be properly permitted and inspected.This means the previous structure you have, if it passed inspection, should be deemed sound as a deck. Even if this is the case, it still may not be strong enough to withstand the weight of a roof because it wasn’t made with a roof in mind. Be aware from the beginning that most builders will only warrant the framed portion of the structure that they build. This means if something goes wrong with the substructure as a result of adding a new roof, you cannot use their warranty anymore.This is why we recommend reinforcing the foundation so it supports the new roofed structure. 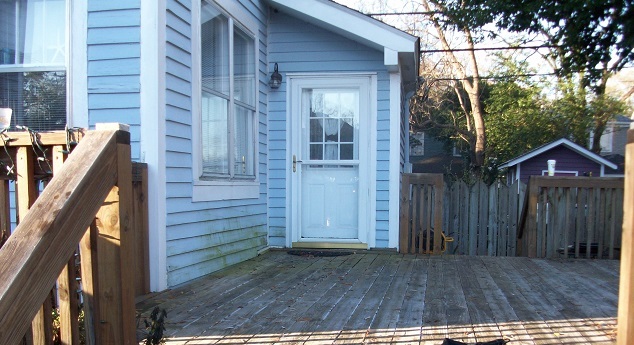 Before: this image shows the existing deck before we converted a portion into a lovely screened porch. By converting a portion of the existing deck for these Columbia, SC, homeowners we were able to accentuate the positive aspects of their outdoor living experience while eliminating the negative.Not only does the new screened porch provide a haven from the hot sun, the screened-in porch also provides a protected, bug-free spot in which to enjoy the outdoors. The completed conversion leaves a portion of the existing deck for the homeowners to use for grilling and other open air activities while the screened porch opens up a plethora of outdoor living possibilities.These Columbia homeowners now view their outdoor space in a different light since the conversion has been completed.To say converting part of their existing deck into a screened porch was a change for the better would definitely be an understatement.The new space has added function and beauty to their backyard and lifestyle. During: these images were taken during the conversion process. The entire project came together beautifully, from start to finish. 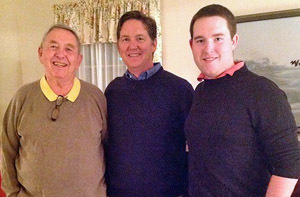 The homeowners are looking forward to being able to enjoy their backyard in peace without the sunburn and the mosquitoes — another “happily ever after” story courtesy of Archadeck of Central SC. 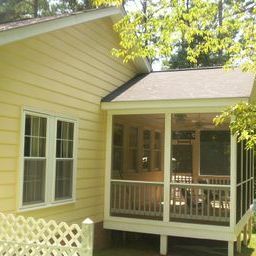 Completed deck to screened porch conversion in Columbia, SC. Please visit our screened porch photo gallery and our three and four-season rooms photo gallery located on our website for more deck -to outdoor- room conversion ideas. This entry was posted in Deck to outdoor room conversions, Outdoor Living, Screened Porches, Shade Structures and tagged Archadeck of Central SC, Archadeck of Central SC explains the importance of hiring a professional when considering a deck to outdoor room conversion, Archadeck of Central South Carolina, Central SC deck and porch outdoor living combinations, Central SC deck designs, Central SC outdoor rooms, Central SC porches, Columbia SC deck and porch builder, Columbia SC Deck Builder, Columbia SC deck to 3-season room conversions, Columbia SC deck to outdoor room conversions, Columbia SC deck to screened porch conversion, Columbia SC Porch Builder, Columbia SC Sunroom Builder, Columbia SC three and four season rooms on April 15, 2014 by archadeckofcentralsc. As Labor Day quickly approaches, many homeowners set their sights on an outdoor space that will enable extended function during the autumn and throughout the cooler months. Protected spaces such as screened porches and 3-season rooms allow the flexibility of outdoor living with the added benefit of protection from inclement weather. Here in the Columbia area outdoor rooms are quite popular and in particular we receive a number of inquiries about transforming existing decks into outdoor rooms. As simple as this task may seem, there is much more to a conversion project than meets the eye. Most homeowners don’t realize that there is more to transforming a deck into a porch or outdoor room than just building a roof over it, so much more actually. In most cases, conversions are possible, but it is crucial to hire an outdoor structure professional who is knowledgeable in decks and outdoor structures. Hiring a professional ensures the safety and success of your intended conversion. Several factors come into play when you consider a deck- to- screened- porch or deck- to- outdoor- room conversion. Deciding whether a conversion is even possible first begins with an evaluation of the structural components of your existing deck. A good majority of decks are not built to support the weight of a roof, so you will need to first verify it is built strong enough to withstand a roof addition. Another factor is how the deck was originally built and what kind of foundation does it have? What kind of joists and beams does the deck have? All these are important questions that have to be addressed before planning can even begin. In many cases we can retrofit the structure by installing new footers to support the new weight of a roof. A foundation strong enough to support a roof needs to reach all the way to the corners of the structure. So, if you wish to expand and add a new roof, the foundation of the structure must be extended and new footers added at the corners to support and hold the weight. What seems like the most simple of questions has to be answered prior to moving forward. Another key consideration is most important: can your builder even get underneath the structure to reinforce it? An outdoor room addition will enhance every season. South Carolina, like many areas of the country, requires everything a quality builder does to be properly permitted and inspected. This means the previous structure you have, if it passed inspection, should be deemed sound as a deck. Even if this is the case, it still may not be strong enough to withstand the weight of a roof because it wasn’t made with a roof in mind. Be aware from the beginning that most builders will only warrant the framed portion of the structure that they build. This means if something goes wrong with the substructure as a result of adding a new roof, you cannot use their warranty anymore. This is why we recommend reinforcing the foundation so it supports the new roofed structure. The road to a deck-to-porch conversion may seem rocky in light of all the specific considerations you need to have your builder cover, but in reality, we can schedule a deck evaluation that will address all these requirements. Archadeck of Central SC can inform you early into your anticipated addition whether a conversion is possible. 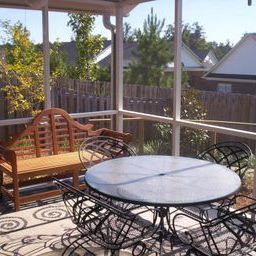 Even if it is not possible to convert your deck into a screen porch or outdoor room, Archadeck of Central SC offers our customers a chance to build the backyard of their dreams through “staged building.” This actually means that we can plan and build your outdoor living structure in stages according to your budget. The benefit in doing this means that you stay poised for growth. For example, we can design and install a versatile deck or patio knowing that in the future when you want a screened porch or 3-season room, the foundation has been laid to support it. Please visit our screened porch photo gallery and our three and four-season rooms photo gallery located on our website for more deck-to-outdoor- room conversion ideas. This entry was posted in Deck to outdoor room conversions, Outdoor Rooms, Screened Porches and tagged Archadeck of Central SC, Archadeck of Central SC explains the importance of hiring a professional when considering a deck to outdoor room conversion, Archadeck of Central South Carolina, Central SC deck and porch outdoor living combinations, Central SC deck designs, Central SC outdoor rooms, Central SC porches, Columbia SC deck and porch builder, Columbia SC Deck Builder, Columbia SC deck to 3-season room conversions, Columbia SC deck to outdoor room conversions, Columbia SC deck to screened porch conversion, Columbia SC Porch Builder, Columbia SC Sunroom Builder, Columbia SC three and four season rooms on August 27, 2013 by archadeckofcentralsc.